There are no important economic reports in Australia therefore traders are looking at the American calendar to release US Durable Goods and US Factory Orders. 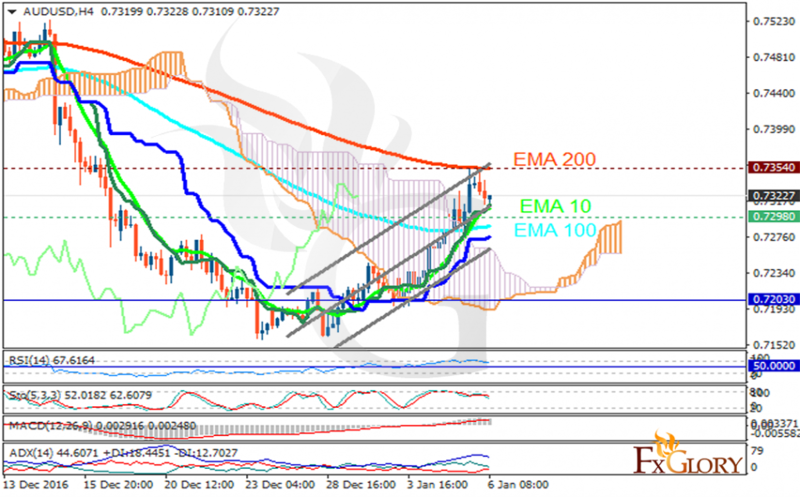 The support rests in 0.72980 with resistance at 0.73540 which both lines are above the weekly pivot point at 0.72030. The EMA of 10 is moving with bullish bias and it is located above the EMA of 100 and below the EMA of 200. The RSI is moving on overbought area, the MACD indicator is in the positive territory and the Stochastic is showing downward momentum. The ADX is showing a weak buy signal. The price is above the Ichimoku Cloud and it is below the Chinkou Span. The Tenkan-sen is showing an upward trend and the Kijun-sen is showing horizontal trend. The chart seems bearish targeting 0.725 area.